Copenhagenize.com - Bicycle Urbanism by Design: Cyclist! Avoid Fines! The police here in Denmark went after cyclists last week, handing out fines for infractions. It was great to see how text messages played a role in Citizen Cyclists communicating with each other, texting warnings about which streets the police were hiding out on. 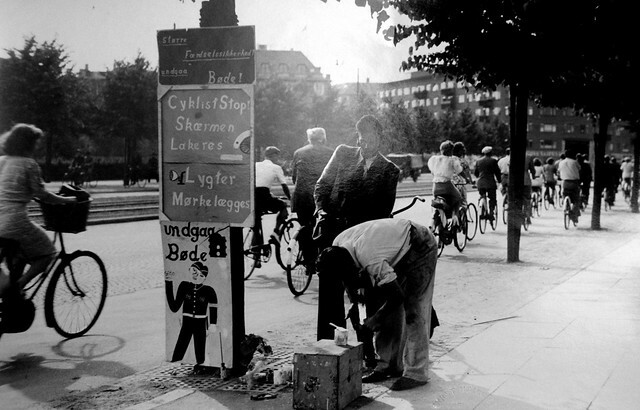 It reminded me of this photo, taken here in Copenhagen during the Occupation in the Second World War. There was a curfew back then and a blackout after dark. Here's an enterprising individual on Gyldenløves Street offering his assistance to his fellow cyclists. And helping gang up on the police. He would paint over your white fender and black out your dynamo lights for you so that the coppers wouldn't get all in your face. As seen at the Copenhagen City Museum.